White House decertifies Bolivia for the 6th time: An exit strategy for an internationally-overstretched Obama administration? I wrote this note in late October, on commission from the Bolivia Information Forum, before getting sucked into other work that meant it got put to one side. Some weeks after, Evo Morales surprised us by publishing a long-awaited government report on the extent of coca production in Bolivia needed to sustain traditional uses, among other useful bits of information that observers had waited some years for. I have not incorporated that here because my piece intends to put forward an idea: that is, that decertification by the US of Bolivia is not a simple case of the Western aggressor versus the poor little Indian boy. I propose here that persistently decertifying Bolivia’s anti-narco efforts is part of a larger effort in the States to diverge from activities that, on a cost-benefit analysis, make less and less sense to be involved in – such as its ‘war against drugs’ in Bolivia. Have a read. On 13 September, the White House ‘decertified’ Bolivia for the sixth year running, in its annual round of such actions. To decertify a country means it is not deemed adequately compliant to United States and international counter-narcotics strategies. Significantly, the US can then decide as a result of decertification to withdraw a range of its aid packages (excluding counter-narcotic and humanitarian aid), impose trade sanctions or even fines on the offending government. Few may be surprised at the US’ apparently heavy-handed policy approach to Bolivia and its counter-narcotics performance, given the extremely fractious relationship between the two nations. But the repeated decision to decertify Bolivia since 2008 does not chime with the country’s performance in reducing coca grown for non-traditional purposes, cracking down on cocaine production, and on narco-trafficking. By its own estimation, the US says that Bolivia’s pure potential cocaine production fell by 12 percent in the year while hectares of land given to coca production fell by 2 percent. But it accuses Bolivia of failing to control the diversion of licit coca into the illicit cocaine production chain, and says that it has not developed or executed a national drug control policy. It does not mention Bolivia’s Strategy to Fight Drug Trafficking and Reduce Surplus Coca Leaf Cultivation 2011-2015. Further, it appears Bolivia is treated differently by the White House to the other two major Latin American cocaine producers, Colombia and Peru – the former being the top producer by considerable margin, while Bolivia is the smallest. Yet neither Colombia nor Peru are decertified by the Obama administration. Colombia’s government, a long-time US ally, appears at pains to comply with US counter-narcotics policies; meanwhile, though, its cocaine production of cocaine has grown, and modern Colombian methods of production allow it to produce more, faster. So why does the White House continue to decertify Bolivia? The tone of Bolivia-US relations in the six years that Bolivia has been decertified cannot be ignored. Evo Morales’ decision in 2009 to expel the US Drug Enforcement Administration (DEA) caused much consternation for the Obama administration, significantly reducing its ability to directly influence the country’s own policies and practices, and, it has said, reducing Bolivia’s transparency. Far from noting any numbers showing that Bolivia has slipped in its counter-narcotics performance, in its Memorandum of Justification for the 2013 decertification, the US put the DEA expulsion at the top of its list of reasons. The DEA expulsion was topped and tailed this year. In February, Bolivia re-adhered to the United Nations 1961 Single Convention on Narcotic Drugs with a new reservation allowing for traditional uses of coca, staunchly objected to by the US; in May, Morales expelled USAID from Bolivia. In July, the Bolivian presidential plane became the subject of international outrage when it was denied entry into French, Portuguese, Spanish and Italian airspace, seemingly under behind-the-scenes pressure from the US which apparently believed whistle-blower Edward Snowden to be aboard with Morales (see BIF’s Special Briefing, 10 July 2013). The justification offered by the White House in its repeated decertifications of Bolivia focus on its alleged “demonstrable failure to make substantial efforts to adhere to its obligations under international counter-narcotics agreements and take certain counter-narcotics measures”. Is Bolivia, while a perpetual irritant to the US in rhetoric and ideology, slipping down the list of strategic priorities? Is it possible that decertifying – more than a political stick with which to beat Bolivia as punishment for the DEA expulsion – is a useful way for the US to gracefully reverse out of its self-imposed policy and aid responsibilities in the country at a time when the White House’s focus has dramatically shifted to the Middle East? To repeatedly decertify the country builds the sense that Bolivia may never measure up to US or international counter-narcotics expectations, with the implication that Bolivia has no intention of co-operating nor a genuine desire to exit the cocaine trade. So far, though the White House has said it could withdraw various kinds of aid, or impose fines or sanctions on decertified countries, it has typically applied a ‘waiver’ so that this has not occurred. Removing this waiver, having built sufficient justification over many years of decertifications, would provide the US its reason to stop spending money on a country of diminishing importance, money whose influence on the Morales government and policies is questionable, and that is much needed elsewhere. Despite criticising Bolivia for a lack of transparency and co-operation on counter-narcotics efforts, which it says was seriously exacerbated by the DEA expulsion, in the 2013 Memorandum of Justification the US said it would close its La Paz-based International Narcotics and Law Enforcement Affairs section by the end of this year. This move is at odds with its protestations for more co-operation and transparency, but will save the US money and effort. A gentlemanly exit from its Bolivian funding exploits would be in keeping with a broader US shift away from worrying about its “backyard”, despite US Secretary of State John Kerry’s blunder in calling the region that (used by Morales to justify the USAID expulsion). In April this year Kerry announced a 14 percent cut in State Department spending in Central and South America .Other forms of US-Bolivia co-operation are strained and some may come to an end anyway. The US is one of Bolivia’s most important trade partners, but the key 2001 US-Bolivia bi-lateral investment treaty was terminated by Morales in June 2012, though it remains in force for another ten years. The DEA, alongside USAID, was arguably the US’s most significant and important aid and intelligence tool in Bolivia, and the expulsion of both agencies hurt its legitimate involvement and influence there. But Bolivia is a distraction from Obama’s efforts to manage the US out of budget-busting exploits in Afghanistan, Iraq and the region at large. Yet to simply back out of US counter-narcotics commitments or aid in Bolivia may jeopardise other more fruitful, but relatively fragile regional relationships at a time when these neighbours are making fresh co-operation efforts with one another via trade blocs such as UNASUR. However, by repeatedly decertifying Bolivia’s efforts, it may be signalling a dwindling interest inside the internationally-overstretched Obama administration in an expensive and combative relationship that brings little benefit at home or abroad. The notion that the US sees decertification as an exit strategy would make more sense than the US’ current justification for this repeated action, which does not tally with Bolivia’s numbers regards counter-narcotic achievements over the period in question. The closure of the International Narcotics and Law Enforcement Affairs section may be the first sign affirming this. When, in 1996 and 1997, Colombia was decertified and faced sanctions, the US faced minimal retaliation risk because then-president Ernesto Samper was deemed in the pay of drug traffickers, and Colombia therefore deemed a weak state. Though Colombia was a US ally, “for most US officials it lacked strategic significance in areas beyond drug enforcement,” according to Coletta Youngers at the Washington Office on Latin America. Similarly, Bolivia may increasingly be seen as less strategically significant to the US now, and decertification may be a symptom of this new reality. What this may mean for Morales, converse to any sense that it may be a wholesale victory to see a US withdrawal from Bolivia, remains to be seen. The White House’s decertification process is itself rather muddled. While it states that a country’s presence on the list of decertified countries “is not a reflection of its government’s counter-narcotics efforts or level of co-operation with the United States”, it adds in the same stroke that: “one of the reasons major drug transit or illicit drug producing countries are placed on the list is the combination of geographic, commercial, and economic factors that allow drugs to transit or be produced, even if a government has carried out the most assiduous narcotics control law enforcement measures”. Today is the 40th anniversary of the overthrow of Chilean president Salvador Allende by General Augusto Pinochet, leading to the reign of terror whose legacy still plagues Chilean society today. I’m off to see two films marking the event, ‘Death and the Maiden” and “Nostalgia for The Light” tonight at Bolivar Hall, both recommended by my human rights tutor Par Engstrom at UCL’s Institute of the Americas where I’ve just completed my MA in Latin American Studies. Thinking back to what I learned about Chile and the Pinochet era in that class, this week I dug out three of the sources I found more useful in learning about that time and about its legacy: Patricia Verdugo’s “Chile, Pinochet and the Caravan of Death“, Leigh Payne’s “Unsettling Accounts: Neither Truth nor Reconciliation in Confessions of State Violence (The Cultures and Practice of Violence), and the essay “Irruptions of Memory: Expressive Politics in Chile’s Transition to Democracy” by Alexander Wilde. I used all of these in my examined essay for the human rights class. which I present below. This was my first ever academic essay writing exercise (I don’t think you can count GCSE level!) 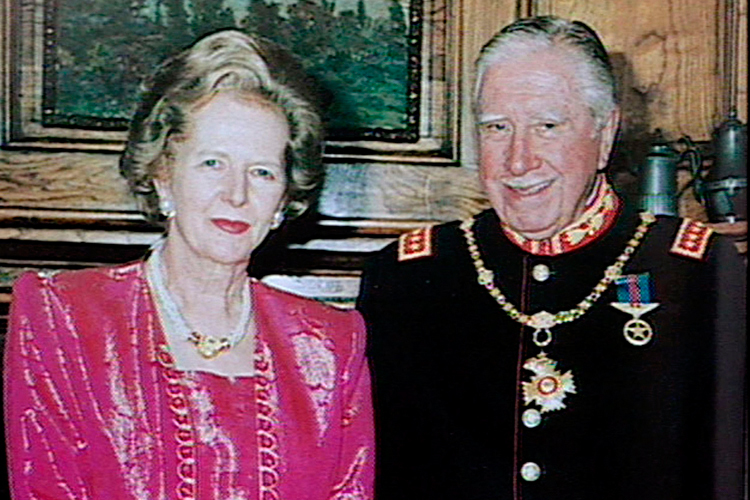 and I picked a horribly complex, un-black and white issue, arguing that reconciliation after such atrocities as committed by the Pinochet regime can never be settled of wiped off the national psychological accounts, so rather, society must seek to bring ‘victims’ and ‘perpetrators’ together with equal value, to find common ground. Of course, this is a hugely challenging and controversial viewpoint, and my essay can probably be accused of being naive, idealistic, unrealistic, ignorant, and coming from the easy standpoint of someone who has only ever read about such atrocities, never experienced them. I would not argue forcefully against those accusations, but I found the experience of reading widely about truth and reconciliation efforts, ‘contentious coexistence’, and cases where this process had taken place seemed to point to a truth: that after so much pain, hate, fear, and generations deep, no amount of retribution or ‘reconciliation’ can change memory. Chile’s own truth and reconciliation efforts are regarded at the success benchmark for other countries that have tried to deal with such atrocities in this way, but Wilde’s essay makes plain shortcomings and failures in that approach, though it is regarded as the best one on offer. But people have to live, and find a way to go on, so I examined cases where, beyond simple ‘truth telling’ followed by simple ‘reconciliation’, forms of contentious coexistence between ‘victoms’ and ‘perpetrators’ of violence had been tried in Chile and Colombia, arguing for this model. I imagine that there would be a range of views on this essay, but in memory of the events in Chile, and to show how ‘live’ and complex those legacies are today – for those affected and students of the time – I’m posting it here. I highly recommend reading the three sources above: only Wilde’s paper reads in the ‘scholarly’ style that some find hard to process, but is still compelling enough to be worth the effort, while the two books are ‘plain English’ in their style and are very accessible, if grim. Much of the scholarly debate around reconciliation within the transitional justice context is heavily biased towards the perspective of victimhood of an authoritarian regime – the tortured, the disappeared, the murdered. Human rights law applied through truth and reconciliation commissions seek reparations for victimhood, through which post-authoritarian democracies offer their societies national reconciliation. This essay asserts that this bias towards victimhood comes at the expense of the role to be played by perpetrators in understanding the violence, context and history that led to terror regimes and their perpetration within them, and the thorny reality that there is often more crossover between victim and perpetrator than truth commissions can reveal. The bias in reconciliation discourse encourages a common victim-perpetrator dichotomy unhelpful to the project. I problematise the dichotomy and argue that transitional justice must valorise perpetrators in reconciliation discourse by looking at examples where perpetrators are also, or have been victims, recognising that perpetrators and victims of such violence have different, but equally weighted perspectives, with a view to constructing national reconciliation. I propose that equalising these actors leads us to a form of ‘contentious coexistence’ (Payne 2007: 279). In this case, rather than two opposing groups (victim and perpetrators here) competing for sovereignty, a range of groups, identities and realities co-exist. I compare the cases of Chile and Colombia, specifically Chile’s Caravan of Death and Colombia’s programme of demobilising and reintegrating former illegal combatants into civil life, as two examples where clear victim-perpetrators exist, explaining how they break the dichotomy. I sketch the implications this has for reconciliation discourse and summarise that through this process, we can re-evaluate what we mean by national reconciliation when victims can be perpetrators, and perpetrators victims. As democracy scholars contend for a definition of the word, scholars of human rights and transitional justice debate definitions of ‘reconciliation’. Post-authoritarian democratising societies seeking reconciliation likewise contend for clarity; who are ‘we’, and who gets to be part of ‘we’? Society is thus split into distinct groups of victims and perpetrators. This creates a victim-perpetrator dichotomy, with clear sovereignty awarded to victimhood. Perpetrators feature only minimally, as a force to be extinguished, neutralised in the clamour for justice after brutality. In part one, I set out some of the discourse on defining ‘reconciliation’ in transitional justice literature, and its bias towards what it identifies as ‘victim’. Part two presents my theoretical base and assertions for breaking the victim-perpetrator dichotomy as a route to reconciliation, viewed as contentious coexistence. Part three demonstrates in practice where perpetrators are also victims, in Chile and Colombia. Part four is a conclusion of my thesis. There is no definition of reconciliation; trying to pin down this “will-o-the-wisp” (Weinstein 2011: 7) may be futile. But it has common characteristics in the transitional justice literature. As Latin American post-authoritarian societies seek to use international law governing human rights, guaranteeing the rights of victims to truth and justice – and expressed in the form of truth commissions – much of the literature is dominated by that perspective. The ‘duty to prosecute’ (Orentlicher 1998:2551; Mendez 1997:261) is one important expression of transitional justice ideals, but reinforces the victimhood bias. Reconciliation has been viewed as a vision of “reconstituted society” formed upon “democratic principles, rule of law and observance of human rights norms”, as an evolution from simply punishing “evildoers” (Weinstein 2011:2). But without defining democracy and with wildly varying comprehensions of human rights norms, it is hard to establish. Huyse (2003:19) captures the essentially contested nature of reconciliation. By his estimation, “backward-looking” reconciliation focuses on healing, reparations for survivors, constructing “a common vision and understanding of the past”. A “forward-looking” interpretation focuses on getting victims and perpetrators to “get on with life, and at the level of society” establishing a “civilised political dialogue and an adequate sharing of power”. The former definition characterises the bulk of scholarly debate on reconciliation. Most Latin American countries that have been through the truth commission process focused on forming one official version of the truth from which reparations can flow to victims. Renner (2012:51) finds academic discourse predominantly framing reconciliation in relation to truth commissions. She sees reconciliation as an ’empty universal’ (2012:52) – an ideological goal delivered discursively, which assumes that truth-telling itself will deliver national reconciliation. The vagueness around the term has, Renner (2012:56) says, encouraged an accepted a ‘reconciliation paradigm’ based in three assumptions: that reconciliation is opposed to retribution, that it requires truth-telling, and that truth-telling and healing are best achieved through truth commissions (2012:56). There is, however, a corridor of literature pressing for the valorisation of the perpetrator in reconciliation discourse, with the broader focus of coexistence for all of society and recognition of difference. Govier and Verwoerd (2004) criticise the way victims and perpetrators are created in opposition in the literature on peace studies as an oversimplification (2004:371). Having worked on the South African Truth and Reconciliation Commission (2004:377) Verwoerd’s views reflect the weight of real experience among practitioners of reconciliation in complex, post-violence societies. Echoing Huyse’s (2003:19) forward-looking model, Bankowski (c2007:49) sees reconciliation as a process of asking ourselves how we can take responsibility for wrongs “that we or our society has committed”, but argues that reconciliation framed in terms of “the sacred victim” (c2007:51) produces a concentration on rights and reparations that stands in the way of putting the self and community in question. He says: “Reconciliation has to start from the recognition of our common humanity and equality in pain and affliction” (c2007: 55) – “we cannot, oppressor or victim, escape….by constructing purified selves” (c2007:55). Shifter and Jawahar (2004:127) see the trend in Latin America towards establishing one version of the truth as leading to reconciliation defined as “peaceful coexistence and respect for difference”, finding that justice for perpetrators “is only one of many tasks that must be undertaken” (2004: 127). They believe, though, that amnesties “are not incompatible with reconciliation, provided they are a product of genuine negotiation and are not imposed or forced, as Chile’s was” (2004:127). But amnesties by their nature are always imposed or forced; they do not simply materialise out of thin air. Humphrey (2002:105) argues that states seeking to establish truth through remembering dichotomise reconciliation and justice. He argues that reconciliation through trials is a function of a new government seeking to found democratic legitimacy by stigmatising the “predecessor’s programme and not just individual accountability for ‘crimes against humanity’” (2002:132) and that this means reconciliation “reconstitutes everyone as members of the same political community”. Humphrey picks two quotes from Taylor (1994:200 in Humphrey 2002:123) to end his assessment of reconciliation: one, that the Latin American ‘Nunca Mas’ truth commissions failed because truth “constructs, invents and is exclusionary”, and two, that remembering is also, therefore, a process of forgetting (Taylor 1994:200 in Humphrey 2002:123). In all of Latin America’s ‘Nunca Mas’ truth commissions amnesties were imposed, subjugating and omitting perpetrators from the process in favour of Bankowski’s “sacred victim” (c2007:51). Tristan Anne Borer (2003:1090) offers three Venn diagrams of two sets apiece, victim and perpetrator, which I use here as the theoretical model from which my assertions arise. The first is two co-centric circles side by side; the second sees the circles start to overlap, and the third set – representing her thesis that there is much crossover between victims and perpetrators – not only overlap, but have serrated edges, driving home the point that binary opposition does not tell the truth about pre- or post-conflict relationships. From here, I assert that deconstruction of the victim-perpetrator dichotomy into a more nuanced picture, where we discover the victim-perpetrator, makes the dichotomy hard to sustain. We no longer have two opposing sides to reconcile, nor one side to which all reparations are directed, but rather a set of people with complex relationships and their own interpretations of society. The implications for transitional justice are that perpetrators are valorised in the reconciliation discourse, seen here as a form of contentious coexistence (Payne 2007:279). Evidently, the concept that perpetration is more diffuse among society is an uneasy one. The focus on legal structures to deliver truth, justice, reparation and reconciliation in the transitional justice literature might be a response to this unease, isolating victim and perpetrator into separate groups and within those, defining types of victim and types of perpetrator or crime that make life simpler. Latin American truth commissions set their definitions narrowly, within specific kinds of crime, or a specific set of dates. Borer’s model shows that some of those individuals may be ‘the enemy’ too. Politically, for a new government at pains to demonstrate adherence to democratic ideals and to be seen to deliver justice, to recognise this could be destabilising – one outlook on the fervour for amnesties founded by post-authoritarian governments, as supported by Humphrey’s thesis (2008:132). Halperin and Weinstein (2004:562) recognise the value perpetrators must have in reconciliation. They suggest a process of rehumanising must occur, where participants in war and conflict must learn to live side by side to engineer the shared “social capital” (Putnam 1993:163 in Halperin and Weinstein 2004:562) needed for society to rebuild itself. They contend that social reconstruction in a transitional society depends on people acting in concert to rebuild societal structures, “requiring respect for and the synthesis of divergent views” (2004:575). Huyse (2003:67) organises offenders in violent conflict into primary and indirect in a way that widens society’s perpetrator net. Primary offenders committed acts that can be brought before a criminal court based on international and national laws, the type of perpetrator that is simple to identify and receives most of the attention in the reconciliation process (Huyse 2003:67). Indirect offenders are “silent offenders” – they profited from the perpetrating regime, remained silent or inactive in witnessing human rights violations (Huyse 2003:67). Payne (2008:138) believes victims of torture hold insight into perpetrators that outsiders do not share, know that perpetrators have no choice but to perpetrate in order to stay within the authoritarian security structure, and that they might have done the same in that situation. They sense how context and history bore down on perpetrators because they share some element of it. After speaking about what they did, Payne (2008:138) says, perpetrators are viewed as equals by victims, without having forgiven them. On that basis, we arrive at Payne’s contentious coexistence (2008:287), where instead of two contending perspectives, a fledgling or recovering democracy enjoys the contest of a range of views and alliances – a spectrum of victims and perpetrators, and victim-perpetrators – in recognition that one version of the truth is neither obtainable nor desirable. Society must play its part by acknowledging history and context that led up to the regime and to perpetration; acknowledging its part in contentious coexistence. Part Three: When are victims perpetrators, and perpetrators victims in Chile and Colombia? The Caravan of Death (the Caravan) was a death squad directed by General Augusto Pinochet three weeks after his September 11, 1973 takeover of the Chilean state, sending a military delegation by helicopter to five military garrisons across the country. Its aim was twofold: to round up civilians named on a list of supposed state enemies and murder them, and in so doing, to terrorise the military into compliance with a regime ousting elected government against a long democratic tradition. The Caravan delivered brutal torture and extra-judicial executions, directed by the General’s second-in-command but physically carried out by officers stationed at the garrisons with no prior notice of the Caravan’s arrival or goals. This diffused perpetrator status among often young, inexperienced officers at a time when Chilean society viewed the military as unobtrusive, professional and trustworthy – conferring an unquestioned confidence in the institution across generations prior. In Colombia, generations of widespread poverty and a societal tradition of extreme political, factional violence, conflated with US intervention that led the Colombian government to resort to draft “indigenous irregulars” into perpetrating terror in state defence (Tate 2001:164 in Theidon 2007:69), brutalising everybody in the civil war characterising the country today. A National Committee of Reparation and Reconciliation is charged with compiling an official historical memory, with a view to democratic strengthening [United States Institute of Peace: 2012]. Colombia began a process of collective demobilisation of combatants in 2003, which since 2006 has been succeeded by a focus on individual disarmament, demobilization and reintegration (DDR) of ex-combatants into civil life. There are some 43,000 ex-combatants involved in these processes throughout Colombia (Jaramillo, Giha and Torres’ 2009:4) in a country where over 70,000 people died in the conflict in the 20 years to 2008 [Amnesty International: 2008]. Both Chile (Hayner 1994:621) and Colombia have sought to establish a single version of the truth on their conflict experiences. Chile had two truth commissions, in 1990 and 2003 (Hayner 2002:xi). Both countries have used amnesty to extract truth from perpetrators, and draw up reparations for victims from testimony, establishing a firm victim-perpetrator dichotomy in a transitional period. In the DDR approach to perpetrators Colombia (perhaps accidentally) recognises perpetrators as victims in a nation long scandalised by violence. This could be evidence of a pre-postconflict environment akin to democratic transition. It is presumed that the next of kin within the first degree of consanguinity or civil relation to the person assassinated or disappeared are victims, although following the decision of the Constitutional Court, other family members who prove that they suffered harm may also be considered victims3.The JPL considers as victims the members of the army and National Police who have suffered physical and psychological harm due to the actions of members of the illegal armed groups. Applying Theidon’s (2007) interviews with ex-combatants that have been ‘reintegrated’ into society in the DDR process places some of those in the first and second classification. One interviewee, 28-year old “J.M”, deserted the guerilla group National Liberation Army when some of its members assassinated his younger brother. He is a victim and a perpetrator. Govier and Verwoerd (2004:372) underscore this when they explain that a person who is perpetrating by supporting violence against “the other side” can concurrently be a victim if, for example, a relative of theirs has been killed in political violence. The third classification of victim in the JPL includes the Army and National Police. This does not recognise that those groups initially joined forces with paramilitaries who, on the recommendation of US military advisors, enlisted “indigenous irregulars” in the Colombian government’s counterinsurgency plan, and created these groups by emergency decree in 1968 (Theidon 2007:69). A presidential decree in 1989 made them illegal (Theidon 2007:69). In this estimation, paramilitaries are victim to that switch in legal definition, becoming enemies of the state and terrorists – perpetrators – after 1989. Jaramillo, Giha and Torres point to controversy around classifying Army and Police personnel as victims (2009:37) and the exclusion of perpetrators of state crimes from the process [International Centre for Transitional Justice: 2012]. On the first classification, what Colombian can claim not to be a victim of one of the described forms of harm by one of the organised illegal groups who, prior to 1989, had legal status by presidential decree? Is, then, not all Colombian society a victim, necessitating the conclusion that many victims are also perpetrators? I am convinced that the junior officers, at least, believed in good faith that they were doing something for the good of the country…[t]hese are people who deeply repent their participation in the executions, and consider it perhaps the worst time of their life. We can consider those individuals victims in the context of the societal norms around respect and trust for the military, in a long tradition of its subjugation to the sovereign power of Chile’s body politic. Most of the 75 individuals murdered by the Caravan gave themselves up to it voluntarily, calmly co-operating when arrested in a night raid on their homes, or appearing in front of new military authorities for the crime of working for the previous government (Verdugo 2001:1). The concept of their lack of safety, or of subterfuge, did not enter their minds. This is because the military enjoyed uncontested trust within a “strong legal culture” and long democratic tradition (Verdugo 200:1) was practically Chilean DNA. This DNA worked in the same way for military personnel, who Verdugo asserts were “forced into fratricidal violence” (2001:1) by this history. For almost 150 years prior, Chilean society saw the military as subjugate to political life. With exception to the 1879 War of the Pacific, the military had no external battles to fight and was viewed by society as a harmless mix of “marches and melodies” (Constable and Valenzuela 1993:40); a safe place to stow less intelligent sons. Constable and Valenzuela (2003:54) assert that Pinochet’s junta sought to secure role reversal of that historic pecking order. Soldiers failing to follow orders “risked being demoted, arrested, or worse” (Constable and Valenzuela 1993:54). This perspective is nonetheless challenging. Consider the case of Armando Fernandez Larios, who was a junior officer that perpetrated in the Caravan. In 2003, he was found liable by a Florida court for “torture, crimes against humanity and extra-judicial killing” in the murder of Allende government economist Winston Cabello at the Copiapo garrison [Center for Accountability and Justice (a): 2012], where Fernandez Larios was stationed. Fernandez Larios had argued that he was not liable as he was simply following orders and was a junior officer [United States District Court, Southern District of Florida, Southern Division 2001:8]. Without removing agency or blame, we can consider Fernandez Larios – with emotional difficulty, but logic nonetheless – to be a victim of the aforementioned history and context, and still view him as a perpetrator. He satisfies Borer’s (2003) model of victim-perpetrator even if he also satisfies Huyse’s (2003:67) direct and indirect offender status, the latter because he went onto become a Major in Pinochet’s army before resigning in 1987 and fleeing to United States protection [Center for Accountability and Justice (a): 2012]. In his work on ‘irruptions of memory’ in post-authoritarian Chile, Wilde (1999:480) points to a number of studies that, he says, argue authoritarian characteristics have been “a consistent feature” of Chile’s historic political institutions – “integral rather than exceptional” and pre-dating the Pinochet regime. He points to a ‘conspiracy of consensus’ (1999:476) among political elites, observable between irruptions, that permeates society at large as a “widespread aversion to conflict” and a low level of societal trust generated not just by dictatorship, but also by political polarisation in years preceding (1999: p. 476). It has been argued that the party politics of Chile today are a continuation of mid-nineteenth century social cleavages and trio of ideological blocs, formed into institutions that sought, and seek, to “reach deeply” into the mechanics of civil society (Scully 1995:100). Wilde points to a scholarly literature that suggests Chile’s conspiracy of consensus is a deeply ingrained character of political culture (Wilde 1997:480). In sum, officers summoned to torture and murder civilians were victims of societal norms operating in the reality vacuum that was the weeks after Pinochet’s power grab. Verdugo (2001:i) implores us to see her pivotal inquiry not “in search of a useless and painful voyage to the past”, but as a contribution to “fraternal reconciliation”. This seems to echo the history affecting our soldiers as described above. Does Verdugo, likewise affected, see her book as another ‘irruption’? Referring to Borer’s third set of circles and applying it to the cases of Colombia’s civil war and Chile’s Caravan as proxy for the Pinochet era of authoritarian rule, we can better understand that reconciliation must involve perpetrators, because we can also view some perpetrators as victims at some stage. Alongside victims of human rights abuse and terror, these perpetrators can tell us about the pre-authoritarian society and how this informed the period in question, giving us the context to shed new light on perpetrators and valorise their input when national reconciliation is the aim. In turn, this can deepen democracy. In this essay I have presented my thesis that the weight of transitional justice discourse on reconciliation falls too heavily on victimhood and on reparations for victims of widespread terror. I assert that this created a victim-perpetrator dichotomy that colours our notions of what reconciliation is to carve out large swatches of society from the process of reconciliation. In trying to show that the dichotomy is an oversimplification of the truth of pre-and post-conflict societies, I have presented ideas from a narrow corridor of the transitional justice discourse and also from peace studies to show that victims can often be perpetrators, and perpetrators victims, examining two specific cases in Latin American societies to show where these groups clearly exist. I have shown that, in breaking the victim-perpetrator dichotomy we can re-examine our notions of national reconciliation and that we must valorise the role of perpetrator if we genuinely seek national reconciliation. I arrive at the concept of contentious coexistence as the resting point at the end of this thesis, a place where not just two opposing groups and ideas compete – and one is more heavily weighted in both society’s mind and in the relevant scholarly literature – but where a range of groups, identities and realities can co-exist, carry different, but equal weight and compete, which can lead to democratic deepening. In the case of Chile, described as a ‘nation of enemies’ (Constable and Valenzuela: 1993), scholars point to regular ‘irruptions of memory’ (Wilde: 1999) that visit society because various realities about the era of terror have not sufficiently been dealt with. Chile dichotomised victim and perpetrator in its search for reconciliation and in subjugating what perpetrators could tell them about context and history, papered over awkward truths that may point to the causes of that period and how to deal with its fallout over successive generations. Wilde’s ‘irruptions’ are proof enough that a single truth has not materialised in Chile, and that a range of truths will continue in contention. In sharing this experience without contending for sovereignty over it, and with time having passed, perpetrators, victims and victim-perpetrators may share Huyse’s (2003:19) forward-looking “civilised political dialogue” and recover the germ of reconciliation. Bankowski, Z. (c.2007) ‘The Risk of Reconciliation’ in S Veitch (ed) Law and the Politics of Reconciliation. Aldershot: Ashgate. Constable, P and Valenzuela, A. (1993) ‘Preface’ in P Constable and A Valenzuela (eds) A Nation of Enemies: Chile Under Pinochet. New York, London: Norton. Constable and Valenzuela (1993) ‘The Soldiers’ in P Constable and A Valenzuela (eds) A Nation of Enemies: Chile Under Pinochet. New York, London: Norton. Correspondent Special: Caravan of Death, 2001. Videorecording. Produced by Jane Gabriel and reporting by Isobel Hilton. UK: British Broadcasting Corporation. Humphrey, M. (2002) ‘Atrocity, trials and justice’ in M Humphrey (ed) The Politics of Atrocity and Reconciliation. London, New York: Routledge. Humphrey, M. (2002) ‘Trauma, truth and reconciliation’ in M Humphrey (ed) The Politics of Atrocity and Reconciliation. London, New York: Routledge. Payne, L. (2008) ‘Contentious coexistence’ in L Payne (ed) Unsettling Accounts: Neither truth nor reconciliation in confessions of state violence. Durham, N.C. ; Duke University Press. Verdugo, P. (2001) ‘The Man of the Coup’ in P Verdugo (ed) Chile, Pinochet, and the Caravan of Death. Coral Gables, Fla. : North-South Center Press. Earlier this month I managed to squeeze in the first piece of journalism I’ve done since I began my life as a Master’s student in October 2012. I was asked to write a blog for Wanderlust, a monthly, British travel magazine – one of the finest – about my experience travelling in Bolivia. The published piece is below – have a glance. I am going back to Bolivia in June for my fieldwork – studying the consumption of second-hand clothing in La Paz and Cochabamba – very exciting times! I only passed through La Paz on my last trip, so this time I’ll have a fortnight to see what it’s all about (and I’m particularly excited to visit the National Museum of Art, which seems to contain a boatload of old religious art, one of my favourite things). The World Economic Forum’s 2013 Travel and Tourism Competitiveness Report put Bolivia first in a list of ten countries it deemed the least friendly for visitors. In the category “attitude of population towards visitors” Bolivia ranked top of the least friendliest nations after Venezuela, Russia, Iran and Pakistan, among others. I’m sure intrepid travellers thought two things in response: that sounds odd, and why don’t I see for myself? Bolivian people are definitely friendly – they are curious about visitors, eager to help you get the best out of their country and they want you to leave happy. Bolivia is emerging strongly from a long history of post-colonialism and neo-liberal economics, and its infrastructure is adequate for the needs of keen travellers. Part of the fun of experiencing a nation in Bolivia’s phase of development is negotiating a new culture and can be readily navigated by anyone with common sense. Most people who spend time in Bolivia don’t forget it in a hurry, and they come away with new friends and an enriched view of the world. Follow the bumpy roads, the frigid plains, eat where the locals eat, and you’ll be duly rewarded. Here are five reasons why you should get to Bolivia now. Any UK resident who commutes to work by train can forget the gnawing rage of exorbitant prices for late, cancelled, dirty and overcrowded trains. Bolivia’s train network is tiny – most of the network has fallen into disuse because the bus network is so vast and convenient – dirt cheap, squeaky clean and takes you through two completely different, dramatic landscapes. The seats are well padded, recline a little, the toilet is clean and stocked with paper (more than can often be said for the UK’s local trains). One trip visitors should enjoy: going north from Tupiza (the stopping off point to horse-ride in the lonely, ferrous quebrada where Butch Cassidy and the Sundance Kid are said to have made their last stand), take the train to Uyuni, the town where tours across the famous salt plains begin. The train leaves around 6.30pm arriving in Uyuni around midnight. The benefit of an evening train in is that, amid the endless lunar-like, uninhabited landscape, the unimpeachable darkness draws your eyes upward. You’re rewarded with an incredible soot-and-diamonds skyscape. Bring a blanket for the ride (buy a good fleece in the market at Tupiza, and treat yourself to a polar jacket while you’re at it; they’re dirt cheap and very useful in high-altitude Bolivia). Then cosy up and keep taking in the big chunk of star-gazing that this train trip affords you. If you’ve heard anything about Bolivia, you’ve heard that it’s poor. You equate poor with lack of food, or decent food. 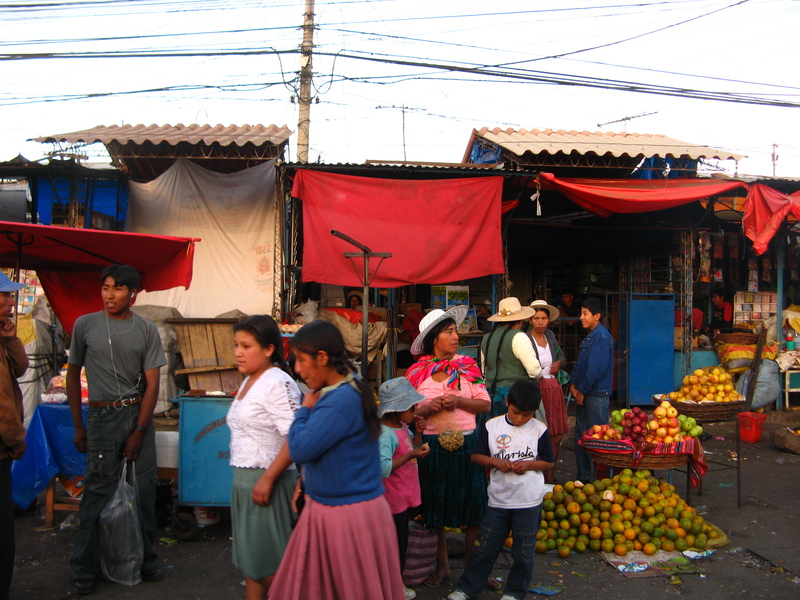 But that’s not true in Bolivia where market food stalls are an unmissable part of a visitor’s experience. Take the salteña, Bolivia’s answer to the pasty (and incomparably tastier). It’s a palm-sized, American football-shaped baked pastry shell consisting of boiled egg, perhaps some chicken or beef, chillies, maybe an olive or two, garlic, onion, sugar and spices,and parsley. Grab a handful of serviettes with your purchase; part of the experience is that the juice inside the shell runs down your hand as you munch. After a few goes, you’ll master it. 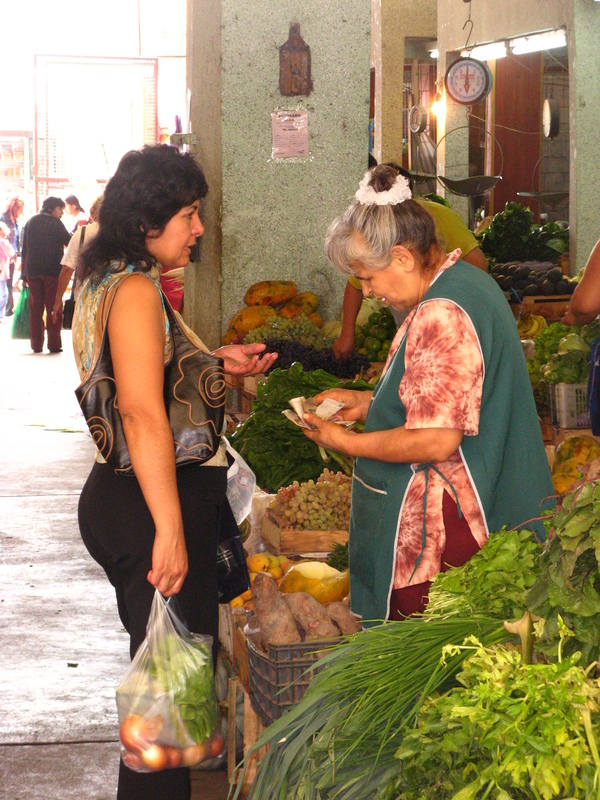 La Cancha market in Cochabamba, a city that marches on its stomach, is good for a tasting trip. Try silpancho, meat schnitzel with rice, fried plantain, onion and beet salad and a lively picante sauce. Wander through the vegetable market taking in all the colours and varieties of the freshest produce that you just don’t find in even the biggest supermarkets. If you’re up for a beer made from corn fermented by human chewing, get your hands on some chicha – it’s a traditional beer but has an acquired taste! Travelling to a poor country, you might be inclined to get your good on. There are many volunteering and gap-year companies operating in Bolivia, as well as lots of NGOs. These are a good way into volunteering in Bolivia: and you’ll come away with new skills and a wealth of experiences. Want to build an eco-farm for local Chapare residents as an alternative to the cocaine trade? Want to see inside Bolivia’s health system and lend your expertise? Want to work with animals that only exist in this part of the world? Bolivia does it. While you’re volunteering, you’ll work with local people, and regardless of your level of Spanish, you’ll be taken under-wing. You’ll eat together, party together, hear about real life there for better or worse, learn how to swear in perhaps several indigenous languages, and get golden tips on travelling onwards to places the usual tourists will miss. Bolivians are well aware that their world and your world are very different; ask them the questions about Bolivian life and politics, and get under the skin of society. If you choose to live with a local family (which many volunteering companies organise), double all of that and throw in a lifelong friendship. Bolivian families are protective. If you’re young and female, do all the things you want to do, but phone your host and let them know you’re going to be out late. Even if you’re in your 30s. They’ll sit home worrying otherwise, because while you’re with them, you’re part of the family. You’re no hostel guest – they want to spend time with you. So many tourists only pass through Bolivia for a couple of days, on their way to Peru or elsewhere. The intrepid should extend their stay and jump on a bus to see a bit more. Most Bolivians use the bus network to travel the country and the wider Latin American region. With such incredible biodiversity, and such diverse ways of living (houses on sticks in the rainforest, self-built apartments on the city limits, crumbling colonial outposts in the ancient cities and in the Eastern missions area, gated and guarded villa-style mansions for the few wealthy), bussing it doubles up the travel-learning experience. Each city has a big bus terminal with all the bus companies selling tickets from little offices next to one another: visit a few to ask how much they charge (ida is one way,ida y vuelta is a return), and ask to see the bus if you want to know what you’re getting into. Trips may be several hours or they may be overnight, or all day. 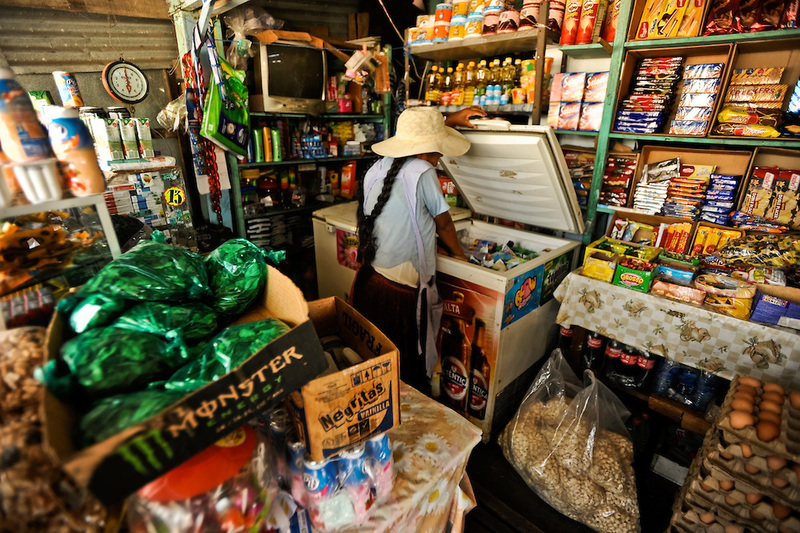 On smaller routes going through villages and isolated areas, you can expect to travel alongsidecampesina (indigenous) women in pollera and pigails, transporting anything from chickens to potatoes or clothes for sale in the markets, other foreigners, and locals of all persuasions. The ladies selling snacks will be there if your bus is an overnight one. Enjoy the scenery, the hairpin bends and the craggy mountain passes, or the steamy cloud forest climbs, as well as long tracts of Inca road or Spanish colonial pebble dash that make the bus rumble. Take your polar coat, a big bottle of water, some biscuits, your iPod, a little torch and some toilet roll (toilet stops on the way won’t stock it). Any bus traveller coming into La Paz at first light will be open-mouthed at the sight, as the bus begins to descend from the mountains into the valley of El Alto, the sheer scale and steepness hits you in the face, millions of tiny houses battling gravity to cling to the mountainside, and a million lights blinking with promise. More locally, Bolivian city transport relies on colectivos (shared taxis) and micros(minibuses) – always have a few Bolivianos in change handy to pay, and have your camera ready to take snaps of the carnival-styled micros that look more like they’re ready to cart diablada dancers. The designated stops micros have are known to locals but not marked on the road; to ask a driver to stop you need to holler ‘en la esquina, por favor!‘ (the corner, please!) to them in enough time for them to stop. It’s not always a corner they’re stopping at, but that’s a catch-all term for a stop. Be loud or be unheard. The city of Potosi in Bolivia’s south (the world’s highest city at 4,000 metres above sea level) might at first seem quite depressing, but it’s a must-do if you want to understand more about Bolivia’s people and history. 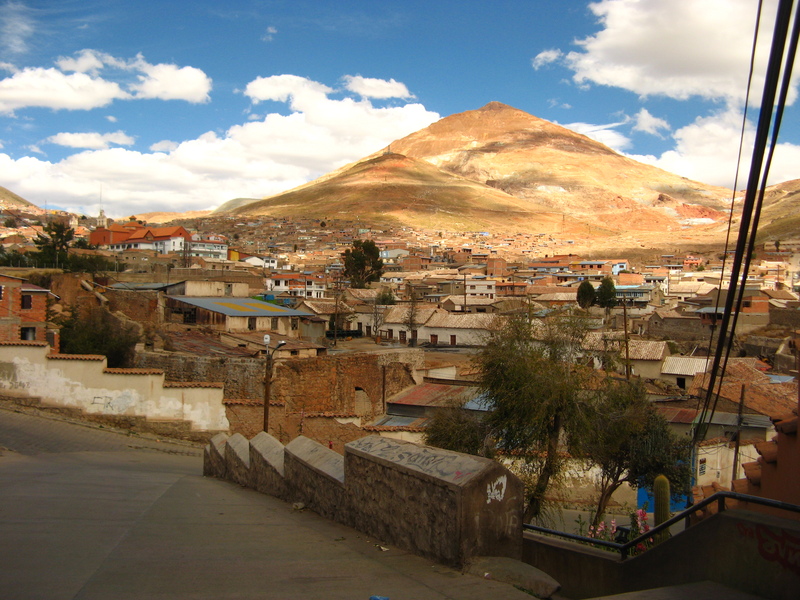 A roughshod, down-at-heel little town at first sight, Potosi was the centre of the Spanish empire for 500 years because a little mountain there, cerro rico, continuously produced enough silver to bankroll the expansion of Spanish power across the continent and to Asia. Today, old churches are the lone representatives of the grandiosity and wealth that characterised the colonial city. You can enter the mines in cerro rico (still in operation) with a guide who is a former miner and a local, who can bring to life the story of the mine and the ruinous legacy for the Bolivian and indigenous people making up the mining community – as well as for the Bolivian national personality. In the centre of town is the Casa de La Moneda, the site of the old colonial mint, now a museum for the mint’s original technologies and for an incredible collection of colonial religious art which, interpreted by a guide, complements your understanding of how silver and Catholicism refashioned Bolivian society. The main market in Potosi might freak you out: butcher women hang man-sized slabs of meat over flaking, high beams of wood, no sanitation equipment to be seen. But don’t miss a chance to have lunch in the market – try the broth, a sort of minestrone with jumbo-sized pasta or loaded up with quinoa. Bolivians may lack the finer things, but they know how to use spices and flavour to perk up any food, and they’re always pleased to see visitors are willing to judge them not by home standards, but by their own unique riches. Melanie Stern is a business journalist and is currently completing a Master’s degree in Latin American studies at University College London, focused on Bolivia. You can read more of her reporting on Bolivia at her blog, melstern.wordpress.com and follow her on Twitter @melvstern. British medical charity Merlin won a charity prize last night and their tweeting about it reminded me that I had interviewed its director of finance, Vicky Ennis, in the aftermath of the Haiti disaster in 2010, about how charity finance people lead efforts to respond to major emergencies of that scale. Very much enjoyed researching and writing this article, and speaking with the finance directors from several charities who responded to the Haiti disaster – have a read. The utter devastation suffered by Haitian citizens after the 7.0 magnitude earthquake that struck on 12 January rendered the biggest humanitarian response ever recorded, reports claim. No ballpark figures yet exist, but several billions in individual donations combined with government gifts and a raft of large celebrity cheque signings amassed unprecedented sums, all within days of the event. Getting it into the country in those first few days, though, proved impossible. Most of Haiti’s infrastructure and banking system are out of action; roads are decimated by mudslides or mountains of rubble from the estimated 280,000 collapsed or badly damaged homes and commercial buildings. And what use is a single dollar bill in a place where the markets, their suppliers and the ports allowing essential imported goods in are destroyed ­ while their proprietors may be among the estimated one million homeless, or the 530,000 dead or injured? In fact, due to the level of disturbance, the response from UK charities to these challenges was quite literally to bundle up thousands of pounds and wire it to Haiti through neighbouring Dominican Republic. Vicky Annis, head of finance at medical charity Merlin, explains that her team of 12 finance staff had to do just that from its central London headquarters. “It has been quite literally a case of three or four members of my finance team taking £3,000 in cash down to our local Western Union several times a day,” she reveals. “It’s enormously time consuming.” Merlin was one of the first charities that had no previous business in Haiti to land there after the disaster. Faith-based charity Cafod’s head of finance James Steel has to employ his skills of persuasion and pull in help from around the business to cover sudden need from finance. Cafod has a financial accounts team, a financial management team and a humanitarian finance team, he explains, as well as donation processing people to call on if it needs extra hands. 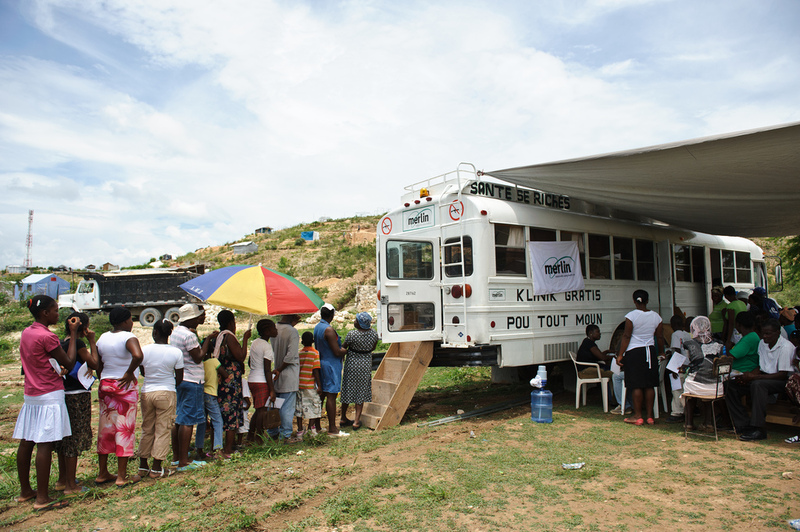 While the process of getting money in the door is now automated thanks to online and text donations, FDs in even large charities found themselves struggling to upscale dramatically in the first days after Haiti to get it out again. It meant diverting finance staff from modest teams away from their usual duties, diverting funds to hire temporary staff or persuading other managers to get their non-finance volunteers mucking in. “This office was full of volunteers processing credit cards on the weekend, because suddenly we had this massive surge and we had no time to plan around it,” says Joe Ghandhi, head of finance for Médicins Sans Frontières UK. “I was ringing our 0800 number first thing every morning to test the response time and some of our country websites had real bandwidth issues, so we had to switch things around.” MSF already had around 800 staff in the field on a long-term programme. Cafod’s Steel concurs. “In the 2004 tsunami appeal we couldn’t change the message on our freephone donation number. It was Boxing Day and I was in the office trying to change it, but we couldn’t get hold of anyone,” he says. Charity FDs are learning valuable lessons around how to plan for these problems that really hamper the increasingly common emergency responses they have to make. In other, ongoing ‘silent’ crises such as the conflict and mass displacement of people in Jos, central Nigeria, or responding to the immediate needs and longer-term rebuilding efforts in Sumatra after last September’s earthquake, getting funds to disaster-struck communities on a regular basis proves difficult, too ­ and is part of the FD’s remit. MSF’s Ghandhi highlights the communication skills needed from FDs in crisis response. His finance function worked closely with its fundraising and press departments on the Haiti appeal to stay informed about what campaigns were running, as it has a direct impact on his mandate. “Because of that, finance knew early that we had a fantastic response from the public so we then had to shift quickly to asking donors to donate for our general programmes rather than specifically for Haiti,” he says. This fulfils its other longer-term projects and uses money wisely. Keeping track of what is spent where, as well as building an overall plan to rebuild communities is something the charity FD needs to balance. Cafod’s Steel says that 72 hours after the Haiti earthquake his finance team were finalising areas of responsibility for spending mechanisms and for setting a framework for accountability. “You need to establish mechanisms for receiving money, setting up o utsourcers which can be complex, then working out how all of it is going to get back into your database and how it is going to be accounted for,” he says. “You’re sending people to Darfur and you have to meet their pension and payroll needs.” Merlin’s Annis designated an additional finance person to manage everything to do with Haiti from the UK and assigned a specific code to all costs arising from the response, to make accounting for it simpler. She adds: “We need to identify our Haiti spend against different donor projects and split them down into project level, start reporting against it and understanding where we are on our budgets.” Merlin will place a permanent country FD in Haiti for the next six months to oversee this reporting process. Against the backdrop of what corporate FDs have had to manage recently, the work charity FDs have done to respond to Haiti and other disasters is impressive. “It can be difficult to scale up in a very dramatic way ­ something that no one in a sane world would do ­ but you just have to do it,” says Cafod’s Steel. “There is the supply chain management, procurement is very difficult and there is all the political stuff. We had a briefing in early February from someone who just came back from Haiti and his message to us was, ‘why send tents when the rainy season is coming, can’t we get into semi-permanent construction’. The logistics of getting materials into the country with no infrastructure make that absolutely impossible.” At some point, though, they’ll just have to. In regular contact with charities across the UK, the Charity Finance Directors’ Group has the big picture view on how the sector responded to Haiti and some chronic issues charity FDs face in disaster response. Acting CEO David Membrey spoke with Financial Director about his observations and where he saw the troublespots for FDs. I’m quite proud of my latest work for Financial Director, where I was editor until last May. It intrigued me to learn at the start of 2012 that the finance director for the Falkland Islands had been promoted to its chief executive. Why would a British Overseas Territory need a CEO, I wondered – and do they report to the Queen? I made some enquiries and managed to get in touch with him to organise the interview I turned into this piece, which is a departure from the usual profile style FD magazine runs because, well, the job and the setting are pretty unique. The man, readers would be pleased to know, is an absolutely standard finance man from the grass roots up, but took a life less ordinary. My only question now is: where does the job of Falkland Islands CEO take you for your next job? I went for the interview because the Falklands and its future is so newsworthy this year, with the anniversary of the Argentine-British conflict and because it is on the brink of becoming an island of the oil rich. It was a real pleasure to explore it – if only FD’s budget could stretch to sending me out there. I must give some props to Richard Crump, who I hired as my deputy editor and who now acts as my de-facto editor in my freelance life, for succeeding in getting some original photographs of Keith in situ. To see one go here. Google Maps adds some more: there’s the 1982 Memorial Wood, the Falklands Brasserie, the Victory Bar. Two blocks over is Victory Green. Zoom out of the port inhabited by most of the Islands’ 2,478 residents and suddenly there’s just wilderness – nothing but long, lonely highways crossing vast tracts of land, where half a million sheep graze and where no trees have ever grown. Padgett arrived in the Falkland Islands in 2001 as its treasurer, fax machine in hand, advised of its perilously slow dialup internet. A Barnsley boy and local government finance careerist, he married in Port Stanley (the Islands’ governor, who acts as the Queen’s representative, gave the bride away), and little more than a decade on, Padgett has the future of his wedding guests in his hands. As for the internet connection, it remains one of their biggest problems, he admits. Its biggest opportunity is the quest for oil. 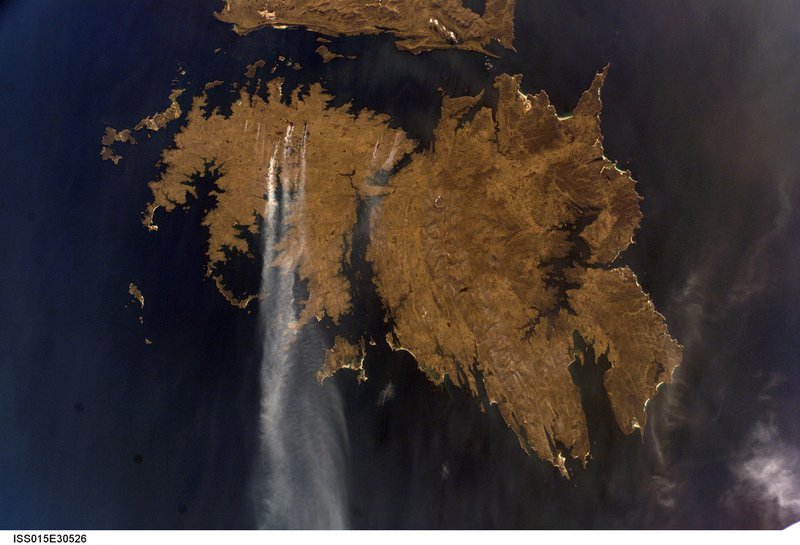 As Argentina reignites the Falklands sovereignty debate, Padgett is studying the effect a major oil find could have on the economy, environment and way of life so cherished by locals. Five exploration companies drilling around the Islands are hoping to find between 8.3 billion and 60 billion barrels of oil, three times what remains of the UK’s North Sea claim. A report published in February by analysts Edison Investment Research suggested FIG could see a $180bn (£116bn) windfall in tax royalties from oil. That compares with its current main source of income, fishing for Illex squid, which brings in $23m annually, demonstrating the pressure under which Padgett currently finds himself. The expansion has already started. Padgett reported a million-pound budget surplus last December on the back of drilling income (as well as a bumper Illex squid crop). When the budget was prepared, there weren’t even concrete plans to drill. In the next financial year, Padgett expects another surplus, again from drilling revenues. While he has received assurances from the industry that onshore effects will be limited by keeping floating extraction platforms and storage kettles, he will spend on readying the Islands to provide a support industry to rigs and vessels. But the tension between the potential for historic economic development and preserving a way of life is palpable. “We need to spend on dock and port facilities, and short-term accommodation – and we’ll have to look at our immigration policies,” he says. All this upheaval could change the Falkland Islands to a very different place by the end of his tenure, but Padgett expects the status quo to remain. “People down here are very conscious that they don’t want oil to change the place significantly. That is going to be a difficult challenge. We are not going to allow a free-for-all – it will not just be a case of grabbing every drop as quickly as possible,” he insists. Having climbed from treasurer to deputy financial secretary and then to financial secretary proper, in 2008 Padgett felt ready for the CEO job and applied. He lost out to Tim Thorogood, but four years later had built the networks to demonstrate his non-financial skill. A place where the entire machinery of government is run by 550 people is going to have the village green feel. Padgett and the other members of the Legislative Assembly take on several portfolios at once; the director of education doubles as director of health. With the Argentine sovereignty row – which analysts Edison say is the single “proverbial spanner in the works” for FIGs’ oil ambitions – looming large, Padgett could expect a change to his daily life. He is “absolutely positive” that Argentina will increase the pressure, but says it makes little impact on his work. Padgett even thinks that Argentine president Cristina Kirchner’s provocations on the sovereignty of the Falkland Islands are helpful. “The amount of rhetoric Cristina produces gives us a world stage to say our piece. Before that, we had a difficult task getting anyone interested in the Falklands side of the argument,” he concludes. Campden FO: Can Western family offices find El Dorado in Latin America? My latest article on Latin America, published by Campden FB, a magazine for super-wealthy business-owning families. There’s such a delay between when I file the copy, when it is published in print, and then when it goes live online, that some stuff seems out of date: the vagaries of publishing. It’s accepted investment wisdom that Latin American economies offer spectacular returns for investors. The region’s economies are expected to continue to soar while Europe and North America bump along the bottom, printing more money just to survive. So is Latin America El Dorado for family offices? Stocks on Mila, a stock market trading Colombian, Chilean and Peruvian companies on a single platform, rose in value by almost 19% in its first 12 months to May 2012, compared with the FTSE 100’s 9% rise and the S&P 500’s 12% in the same period. Brazil’s minimum wage will increase by 14% in 2012 and public expenditure on infrastructure is expected to rise. Such numbers have the same effect on investors as micro-bikinis on Rio’s Carnival-goers. But Latin America has other attractions. It is in general more stable than it used to be (Argentina notwithstanding, see box). Such horrors as narco-trafficking and corruption are no longer as endemic as they once were in the region. Most pertinently, in many Latin American countries a massive middle class is rapidly emerging, and with that comes demand for better healthcare, retail, banking and other products and services. To meet that need, a Latin Mittelstand of dynamic, fast-growing businesses has begun to emerge; just the sort of businesses that appeal to investors. The Latin American region still only represents a modest corner of most family office portfolios – usually between 3% and 5% – but it is increasing. Some family offices are taking advantage by buying up direct controlling stakes in growing businesses. Others are allocating capital to funds and funds of funds, channelling into the new area of middle class-targeting businesses. Vitally important when moving into a new region is finding the right partners. Investment advisers helping European family offices access the region for the first time say they avoid the global finance names operating there and seek out the local banks, investment managers and local family offices with which to co-invest. Not only are the fees charged by local operators much lower, they are the only partners who really understand the environment, the risks and opportunities on the ground. Plus, the local families have skin in the game and an interest in picking winners. Corinna Traumueller, chief executive of Family Office Management Consulting, which works with families all over the world, says: “Family offices want a partner who can give them a good estimation of the risks in that region, especially political instability, in places like Brazil or Argentina; they’re asking now how Latin America can fit into their portfolio. They’ve done land investments there, they’ve done commodities there, and now they are interested in small businesses where they can invest significantly in a venture opportunity with a local partner.” She says a number of her clients in New York and Miami are particularly keen on Latin America, although the Europeans on her books have so far not taken the plunge. Personal contacts can help, of course. 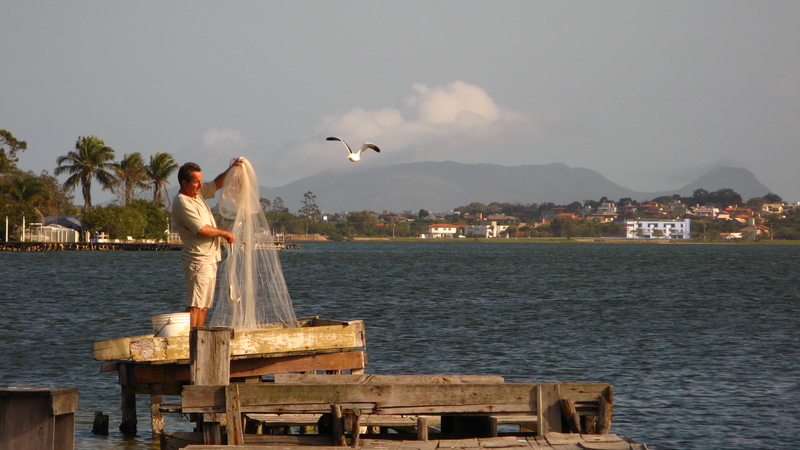 When he was looking at the region, Rod Walkey, managing director of Latin America Alternatives Management and formerly chief investment officer at Migration Capital, the family office for the founders of Fortune 500 technology company EMC Corporation, teamed up with a Harvard MBA classmate who used to be the portfolio manager for the Petrobras pension plan’s private equity group. “I interviewed several private equity managers in Brazil and came to the conclusion that it was going to be difficult to find the best managers on my own,” says Walkey. “You want locals that have done at least one fund and can show a track record. I searched for a fund of funds but there was no good alternative, so I wrote a business plan for one of my own. Through my study at Harvard I met my business partner, who had invested $1.5 billion into just about every local fund manager in Brazil. He had a very deep scorecard system and all the analytical tools that have tracked the market for five years; it shows me who the real players are down there, where the best deals are, and that means we get entry valuations far lower than foreign funds can.” Together Walkey and his partner built a $400 million private equity fund of funds investing into mid-caps in Latin America. Amid the excitement, a quick reality check. Investing in Latin America is not a sure-fire winner. SAP forecasts growth in Latin America to slow from 4% in 2011 to 3.5% in 2012 and 3.6% in 2013, and believes the region will be prone to shocks as Europe’s economic shifts play out. Emerging markets including Latin America will see more capital inflows from abroad as they post stronger growth than advanced economies, the agency says, but warns “there will be periods of reversal and tighter financing conditions”. And while there are undoubtedly opportunities, foreign investors might well find it tough to get hold of the real peaches. The very best local investment houses and family offices often don’t need to co-invest with outsiders. “Perhaps they don’t need the capital, or they don’t want to share,” says Rampart’s Noble. Walkey agrees that this can be a problem. “Most of the money going into the local funds is from pension plans,” he says. “In my opinion, the best local managers are the ones who aren’t looking for money outside their market, because they have a sufficient supply from their home market from those pension funds.” The ones who are looking abroad are the ones who have to. El Dorado hasn’t been found just yet. Cristina Fernandez de Kirchner’s decision in April to nationalise the 51% stake in Argentinian oil company YPF that Spain’s Repsol owned is a reminder of the risks posed by investing in some Latin American economies. Two weeks later, neighbouring Bolivia – already in The Hague with British utility operator Rurelec over its nationalisation of that company’s Bolivian assets – nationalised the country’s main power grid, owned by Spanish firm Red Eléctrica Corporación. Repsol says it will pursue compensation; possible tariff punishments are threatened by the European Union, and EU trade commissioner Karel De Gucht says it may take the case to the World Trade Organization. Economic arguments are put forward to explain nationalisation; the pretext that foreign owners had not invested sufficiently to make the assets work for their host countries. Beneath that is the thorny issue of sovereignty – soberania – and votes. The spectre of colonialism is a common lever among some Latin American governments desperate for the popular vote. As China’s dominance in Latin America grows, there are fears Argentina will write more protectionist investment rules, as did Brazil in 2011 over foreign land ownership. “Argentina is going in the same direction because of Chinese and Middle Eastern investors in the region. Governments want to be careful how much of their resources are owned by foreigners,” says one Argentinian family office investment adviser. “Argentina has fallen off the map as far as investors are concerned.” That said, FOMC’s Traumueller says families she speaks with put Argentina second on their list of interests after Brazil. My latest published profile for Latin News – very much enjoyed researching and writing this (thanks to Sarah Sheldon for editing). Gave me a taste for possibly working there in future. Also made me curious about the Panama Canal Authority’s claim to the highest and most rigorous transparency, anti-corruption and corporate governence standards, versus being a sort of appendage (a GDP-critical one) of the Panama government – frequently said to be one of the most thoroughly corrupt in the Americas. Who is he? The Board of Directors of the Panama Canal Authority (ACP) (an autonomous government agency) recently named engineer Jorge Luis Quijano as the new Panama Canal Administrator. Why watch him? Quijano, who officially takes over from Alberto Alemán Zubieta in September 2012, assumes the post at a critical time for the Canal and for Panama. The massive five-year US$5.2bn project to expand the Canal, by constructing a third set of locks, is due to be completed by October 2014. The expansion plan is crucial to President Ricardo Martinelli’s US$13.5bn 2010-2015 infrastructure plan to turn Panama into the “Hub of the Americas”. In its 2006 report on the expansion plan, the ACP forecasts that, in the most probable scenario, Canal traffic volume will go up from the 279 million PCUMS (Panama Canal/Universal Measurement System) tons that passed through the Canal during fiscal year 2005 to nearly 510m PCUMS tons in fiscal year 2025, which represents an 82% increase. With the expansion of the Canal, the ACP expects Panama’s GDP to experience an average annual growth of 5% over the next 20 years (from 2005) until reaching US$31.7bn in 2025. Alemán recently raised questions as to whether the expansion plan will be completed on time. Place of birth: Panama City, Panama. Education: An engineering graduate from Lamar University in Texas, Quijano also has a Master’s degree in industrial engineering and management from the same university. He is a graduate of Executive Management Programs, both in the Federal Executive Institute, Charlottesville, Va., and the Northwestern University, Chicago, Ill, US. Public Life: Having started his professional development in the Texaco Oil Refinery in Panama, where he worked as a process engineer and product forecaster, Quijano began his career with the Panama Canal in 1975. He moved up the professional and managerial promotion ladder to the position of Maritime Operations Director in 1999, responsible for the largest department of the Canal organization, overseeing some 5,000 staff. Under his chairmanship of the ACP’s ISO 9001 Quality System Executive Committee, the Department of Maritime Operations obtained the ISO 9001 Certification issued by Det Norske Veritas in May 2001 and subsequent re-certifications. After having led the Maritime Operations department for over seven years covering the transition from US to Panamanian administration, since September 2006, he has been in charge of the US$5.25bn expansion plan; to that effect, he was appointed as Executive Vice-President of the Engineering and Programs Management Department. He has also intermittently taught at the University of Panama’s Graduate Law School Program covering subjects related to the maritime sector. On 9 March 2012, the ACP board of directors named Quijano the new ACP administrator. 1999: Appointed maritime operations director for the Panama Canal Authority (ACP). 2006: Put in charge of ACP’s Expansion Program. 9 March 2012: Appointed ACP administrator. Strengths: A career engineer, Quijano has done many of the ‘oily rag’ jobs involved in running and developing the ACP over his long-running career there, and is well equipped to deliver. Just as important is his apparent independence from political affiliation or business connections. Over the years the various governments have strenuously sought to keep the reputation of the ACP intact; while this has been largely successful, a few clouds gathered in 2010 amid the release of a US embassy cable via ‘Wikileaks’ which pointed to corruption. 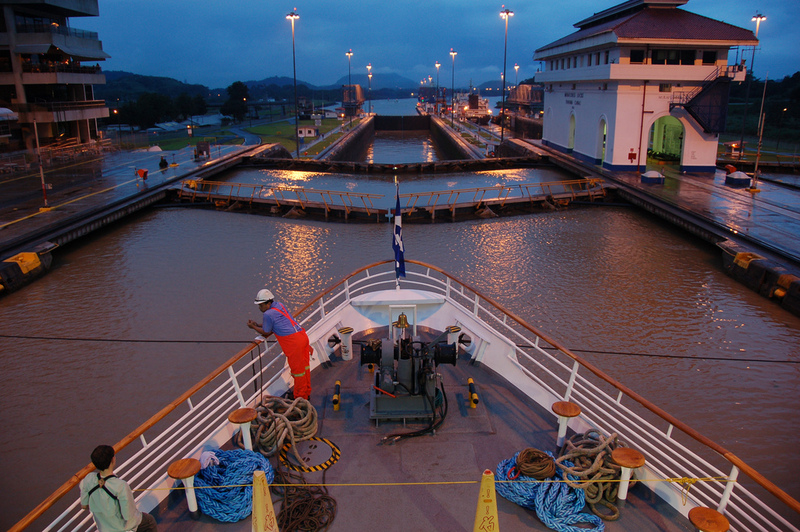 Dated 8 January 2010, the cable raised questions over the July 2009 decision by the ACP to award the biggest contract under the expansion plan (for the US$3.12bn construction of a new set of locks) to the consortium Grupo Unidos por el Canal (GUPC). Led by Spanish construction giant, Sacyr-Vallehermoso, the GUPC includes Panama’s CUSA which is run by Rogelio Alemán – cousin of the ACP administrator. Quijano appears to have no such political connections and will be aware to the damage any further such allegations could have on a largely unblemished corporate governance record at the ACP. Weaknesses: Alemán recently admitted that there had been a seven-month delay in pouring cement (which should have begun in January 2011 but didn’t start until July 2011) due to the fact that the mixture did not have the right specifications. The possible delay in delivering the project could prove embarrassing for Quijano who will oversee its completion. Quijano was cited by the international press as suggesting that the expansion project would probably be ready for a trial run in December 2014 while local news sources reported last month that the GUPC had written to the ACP to say it would not expect the Canal to be ready until April 2015. Prospects: Quijano’s prospects are inextricably linked to the completion of the expansion project. Alemán recently told reporters that failure to observe the deadline could result in penalties of up to US$54m for the ACP while early completion would earn it US$50m. Some 6,000 workers on the expansion project went on strike in January 2012 and the resultant agreement over better wages and labour conditions should for the time being keep industrial action at bay. But if deadlines are missed and penalties are issued, political pressure will bear down hard on Quijano, and if the quality of the work is not up to scratch, he could face problems later in his tenure.